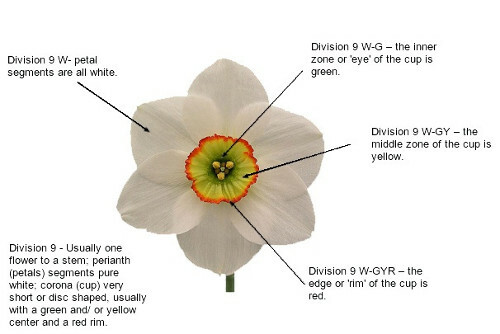 Daffodils are given a color code to describe both the perianth (petal) color and the corona (cup) color. When looking at a 'daffodil code', the first number is the division. The letter or set of (up to three) letters that follows the number, represents the perianth (petal) color. The petal color is described by beginning at the outside edge of the petal, then the middle, and lastly the inside part next to the cup. The second letter or group of letters represents the color of the corona (trumpet or cup) starting from the inner-zone or "eye", then the mid-zone and lastly the outer edge or rim.